It Happened On This Date In History! The 10th Cavalry Regiment is a unit of the United States Army. 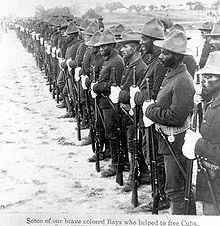 Formed as a segregated African-American unit, the 10th Cavalry was one of the original “Buffalo Soldier” regiments. It served in combat during the Indian Wars in the western United States, the Spanish-American War in Cuba and in the Philippine-American War. The regiment was trained as a combat unit but later relegated to non-combat duty and served in that capacity in World War II until its deactivation in 1944. The 10th Cavalry was reactivated as an integrated combat unit in 1958. Portions of the regiment have served in conflicts ranging from the Vietnam War to Operation Enduring Freedom and Operation Iraqi Freedom. The current structure is by squadron, with the 1st, 4th, and 7th Squadrons assigned to three brigades of the U.S. 4th Infantry Division at Ft Carson, Colorado. This entry was posted in It Happened On This Date In History!. Bookmark the permalink. ← It Happened On This Date in History! Urbs in Horto Exhibit is now AD equipped!